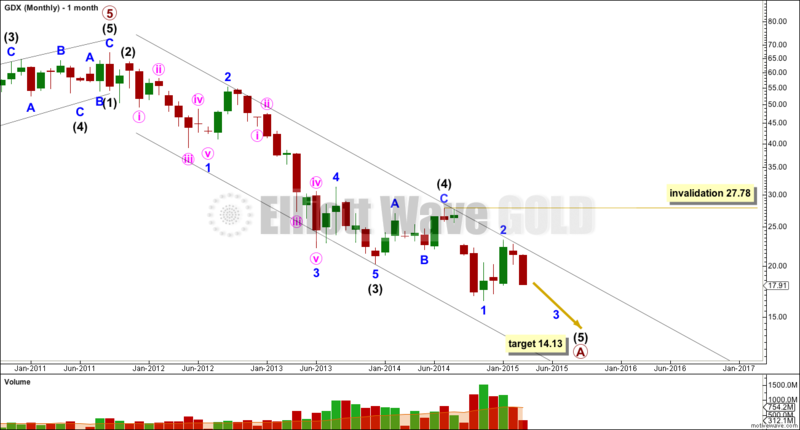 A slight new low below 20.42 is enough to invalidate the alternate Elliott wave count. For GDX I now have only one Elliott wave count. 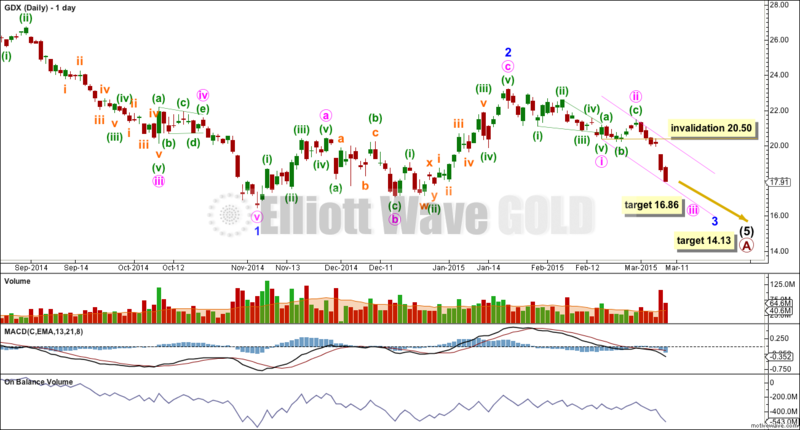 GDX does not appear to have sufficient volume for Elliott wave analysis of this market to be reliable. It exhibits truncations readily, and often its threes look like fives while its fives look like threes. I will let my Gold analysis lead GDX, and I will not let GDX determine my Gold analysis for this reason. I have learned the hard way, specifically with AAPL, that in a market with insufficient volume (even at a monthly chart level) if a movement looks like a three or a five that this apparent clear structure may not be relied upon. For GDX this downwards movement looks like a developing five as an impulse. The final fifth wave for intermediate wave (5) looks like it is underway. The channel drawn here is a best fit. The upper edge has recently provided resistance again. At 14.13 intermediate wave (5) would reach equality in length with intermediate wave (1). However, so far in my analysis of GDX I have noticed it does not reliably exhibit Fibonacci ratios between its actionary waves. 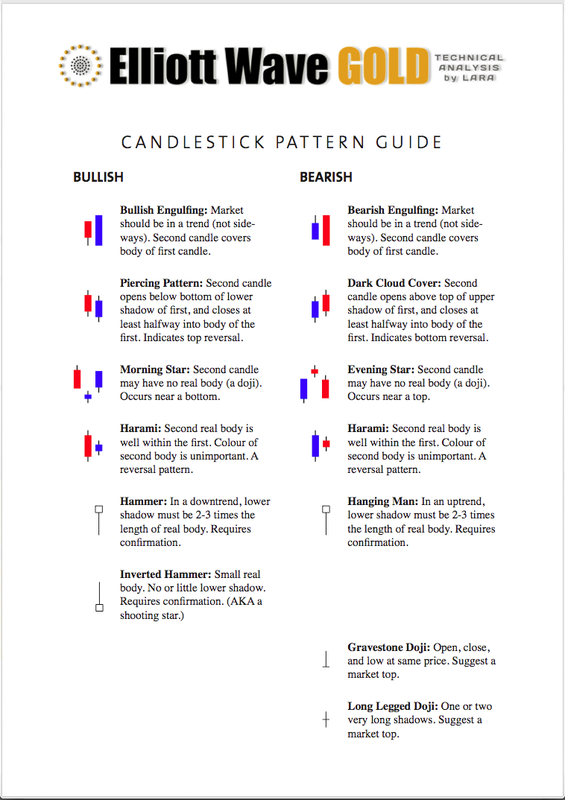 This makes target calculation with any reliability impossible for this market. The target at 14.13 is indicative only of a somewhat likely point for downwards movement to end. Within intermediate wave (5) minor wave 2 may not move beyond the start of minor wave 1 above 27.78. I had expected minute wave ii to move higher to 22.13 or above. It did not manage that, and only managed to correct to 0.389 of minute wave i. At 16.86 minute wave iii would reach 1.618 the length of minute wave i. This target expects an extended fifth wave to end minor wave 3 so that minor wave 3 moves far enough below the end of minor wave 1 to allow room for subsequent upwards / sideways movement for minor wave 4, which cannot move back into minor wave 1 price territory. As minute wave iii continues lower keep redrawing the channel. 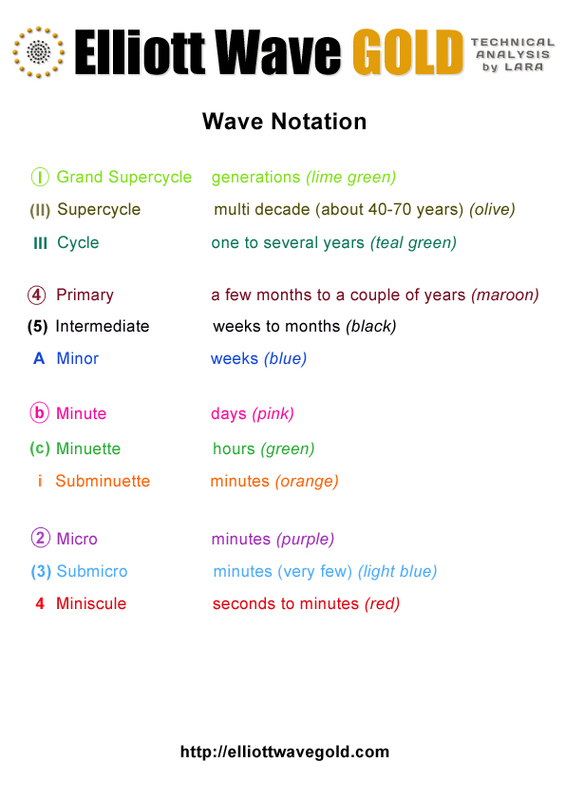 Draw the first trend line from the end of minute wave i to wherever minute wave iii ends, then place a parallel copy on the high labelled minute wave ii. Minute wave iv may be contained within this channel. Minute wave iv may not move into minute wave i price territory above 20.50. Will you be updating GDX as well?